Watercolour of the Shrine of Shah Arzani in Patna from 'Views by Seeta Ram from Patna to Benares Vol. II' was produced for the Lord Moira, afterwards the Marquess of Hastings, by Sita Ram between 1814-15. Marquess of Hastings, the Governor-General of Bengal and the Commander-in-Chief (r. 1813-23), was accompanied by artist Sita Ram (flourished c.1810-22) to illustrate his journey from Calcutta to Delhi between 1814-15. 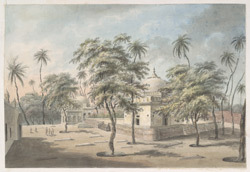 The shrine in Sultanganj of Shah Arzani, who died in Patna in 1623, ad which used to attract both Muslim and Hindu devotees; it was the site of an annual fair. View of the shrine of Shah Arzani at Patna, surrounded by other tombs and trees. Inscribed below: 'Shak Amzun a Musselmaun Priest's Tomb at Patna'.